The past requests page can help you navigate & filter through your previous requests, including completed, cancelled and expired requests. All previous requests, including completed, expired and cancelled jobs can be found on your previous requests page. You can easily use the filters at the top of the page to filter by status (completed, expired, canceled), sites, date ranges and any personalised labels you've assigned to your requests. From the Previous Requests view, you will be able to post similar requests and download your past invoices. You are also able to see which user cancelled your requests & when. 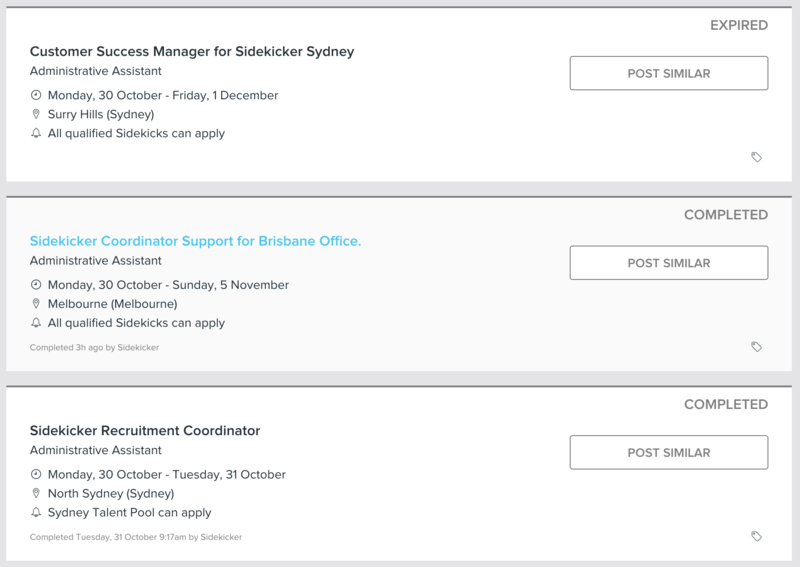 By clicking 'Post Similar' you will be taken to the 'Post Job' screen. 'Post Similar' will copy the job title, description, skills, location and contact details to a new job. You will be able to input the required date, time and pay rate of the shift and confirm this before posting your request. For more information on how to post a new job, check out how to post a job and how to navigate your live requests page.